Celestial Drum Tendai Buddhist Sangha is one of the local Indian Lake sponsors for the 19th annual Central Adirondack Community Pride Day. People work together, including teachers and students from the school, to clean up what debris the melting snows have revealed (the snow will be melted by then, right?) If you wish to help out, you can simply show up at the town hall on Wednesday, May 1 at 9 a.m., or sign up in advance by calling town hall at 518-648-5828. At noontime, there will be a free lunch for all the volunteers. I hope to see you there. Parinirvana Day is a Buddhist festival marking the death of the historical Shakyamuni Buddha held on February 15 in East Asia. (South Asian Buddhist traditions celebrate the Buddha’s birthday, enlightenment day and death on a single day in springtime known as Vesak). After 45 years of teaching the Dharma and leading the community of monks, nuns, laymen and laywomen, at age of 80 and in declining health he announced to his followers that he would soon die and enter parinirvana. The Buddha, being omnipotent, of course knew when he was going to die and was well prepared. He had set out as a young man to understand the causes of human sorrow, discontent and suffering and to find a release. In this he was successful when at age 35 after 6 years of searching he attained enlightenment, awakening, or nirvana at the sight of the morning star rising the in the east. From then on he traveled throughout what is now northern India teaching others how they might find that same release, bringing the Dharma to untold countless number of beings human and nonhuman. But while the Buddha was prepared for his death, his disciples were certainly not. Perhaps they felt, like author William Saroyan, that while they always knew everyone died, but thought that in his case an exception might be made. Ananda, his personal attendant for all those years, ran out of the room crying at the thought of loosing his teacher and the leader of the Sangha. Shakyamuni sent after him and asked him to dry his tears and to return to the room where the Buddha lay. “Who will guide us? Who will lead the Sangha when you die? How will we continue?, “ wailed Ananda. The Buddha replied that he taught for 45 years how to guide the Sangha, how to practice, how to attain awakening. “I have held back nothing. You have all the teachings I have to offer. They will be your guide,” Shakyamuni replied. To emphasize that the Dharma is not exclusive to anyone person, he named no successor. All of his disciples were able, if they followed the teachings he had offered during his lifetime, to reach nirvana. And just what is nirvana? And Parinirvana? The Buddha said very little about either and discouraged speculative lines of thought when questioned. That, of course, hasn’t stopped over 2 millennia of commentators to offer their suggestions however. When he did speak of it, he usually spoke of what is not, rather than what it is. The term nirvana comes from the root meaning to ‘blow out’ or ‘extinguish’. Which unfortunately and incorrectly is sometimes taken to mean ‘annihilation’. Rather, what the Buddha was saying was extinguished were negative states of mind based upon desire, anger and [spiritual] ignorance that lead to negative words and negative actions and hence, sorrow and suffering. When those negatives states are extinguished through clearly perceiving the true nature of reality, a pervasive subtle joy becomes the field of experience. Parinirvana means ‘final’ nirvana. The experience of nirvana attained as a result of enlightenment or awakening puts an end to the generation of new karma that would impel additional rebirths. But because one still has a physical body subject to illness and death like Shakyamuni Buddha himself, while suffering has been extinguished, life continues its course. Sometimes this is referred to as ‘nirvana with residue’. At the time of death, final nirvana releases this ‘residue’ and there is no further rebirth. Parinirvana Day offers us an opportunity to reflect upon the Buddha’s life and his death and the gift he offered—a way to the release from sorrow, discontent and suffering. It also offers us an opportunity to reflect upon our own life and death. When we think of death at all, we may, like Saroyan believe that an exception will be made in our case. Or we may think of it as a distant event that has no connection to our day-to-day actions. Or we may be frightened out of our wits. When we reflect upon our own death we are brought to acknowledge the gift we have been given with this life and the opportunities we have to use it well. A life seems like a long time to hold in your hand. Our life, though, is made up of the accumulated thoughts, words and actions that we take moment by moment. Aristotle said that “We are what we repeatedly do.” While a single action may not seem like much, those actions accrued over time make up a life. Shakyamuni Buddha set out to investigate the nature of human discontent and suffering and to find a release. His used that intention to guide his actions day by day. Try this, see the results. If not try that, see those results. By so doing he attained his goal. And having attained the goal he then set out to share his realization and his methods with others. Day by day he taught individuals and large assemblies. He continued to practice and investigate. At the end of his life he had thousands of followers over a vast area. After his death his teaching spread benefiting countless others. Now they have spread around the world. Join us for our New Year’s Eve meditation to enter 2013 with peace and equanimity. We gather at 10:30 p.m. (with meditation instruction for those who wish). The meditation begins at 11:15 p.m. and crosses midnight. Light refreshments shared afterwards. All are welcome. Translated by Acharya Buddharakkhita, Buddhist Publication Society. Metta (or maitre, skt.) is the practice of unconditional, universal loving kindness. It is a friendly benevolence for the well-being of all others without exception devoid of self-interest. Metta is practiced unilaterally. You don’t wait for someone to have regard for your well-being before you have regard for theirs. Metta is practiced without boundaries. It is relatively easy and natural to be kind to someone just like us. Metta is practiced, yes towards those like ourselves, but also towards those who are unlike us, offering them warm regard for their own happiness, their safety, their well-being in all ways. A vengeful act does not bring peace or ‘closure’, whatever that might be. It plants the desire for revenge in the ones suffering the violence. And on… and on… You can’t fight your way to peace or hate your way to love. If violence brought about peace, then the Mideast would be the most peaceful place on earth. Here and everywhere, violence in revenge yields only violence. A hateful word brings only a hateful response. It is not about who is ‘right’ or ‘wrong’—everyone is some ‘right’ and some ‘wrong’. Peace is the way to peace. Having kind, self-less interest in the well-being of others reflected in our thoughts, our words and our actions is the way to heal our own minds and bodies, the way to heal others, the way to heal our families, our communities, our nation and our world. 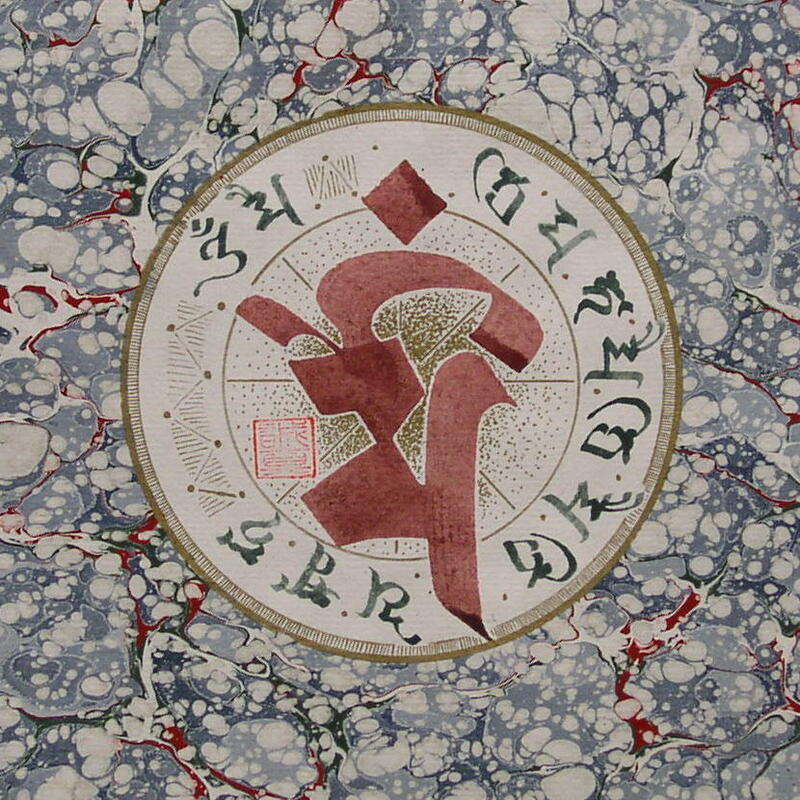 This Sanskrit calligraphy contains the ‘seed syllable’ (central red character) and mantra (smaller green characters) of Maitreya Bodhisattva, the manifestation of universal loving kindness. The mantra om maitri maha maitri maitriye svaha contains within its sounds all these beneficent qualities reduced to a few words. The literal meaning is not important. Meditation upon, or recitation, of this mantra fills the mind with universal loving kindness and overflows outwards towards all others. The seed syllable, likewise, reduces all the qualities contained in sounds of the mantra and reduces it to a single sound: maim (pronounced mime). May all beings everywhere be free from hostility; may all beings everywhere be safe, secure and healthy in their bodies; may all beings everywhere be filled with peace, contentment and happiness in their minds. August 18, 2011, begins a new round of Thursday Evening Services, an amalgamation of two services regularly performed at Tendai temples. The first is the Morning Service based upon The Lotus Sutra and the other is the Evening Service based upon The Amitabha Sutra. At our local Sangha, we began these services last year and recently completed a full round, each weekly service based upon one of the twenty-eight chapters of The Lotus Sutra, the central sutra of Tendai Buddhism. The Service begins at 6:30 p.m. at 6393 State Route 30 (West Main St.), Indian Lake. I’ll be writing a brief chapter-by-chapter commentary on The Lotus Sutra each week, which you can find here. Seishin Jack Fitterer of Indian Lake, along with five other Tendai Buddhist monks from the United States and Denmark became the first trained outside of Japan to receive Soryo Tokudo, an advanced ordination requiring a minimum of six years of study and practice. 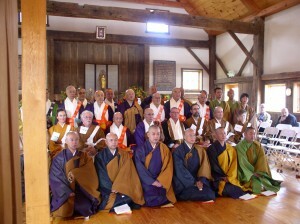 Thirty monks traveled from Japan to the Tendai Buddhist Institute (www.tendai.org) located in Canaan, NY, to take part in the ceremony on Saturday, October 23, 2010. It was officiated by Ven. Komori Shukei, envoy from the headquarters temple of the Tendai sect located on Mt. Hiei near Kyoto. This ordination ceremony represents the recognition by the Tendai sect in Japan of the training program developed at Tendai Buddhist Institute, the only such program located outside of Japan. This ceremony was held in conjunction with another earlier in the day celebrating the fifteenth anniversary of the founding of Tendai Buddhist Institute in 1995 and the fifth anniversary of the consecration of the temple located there. 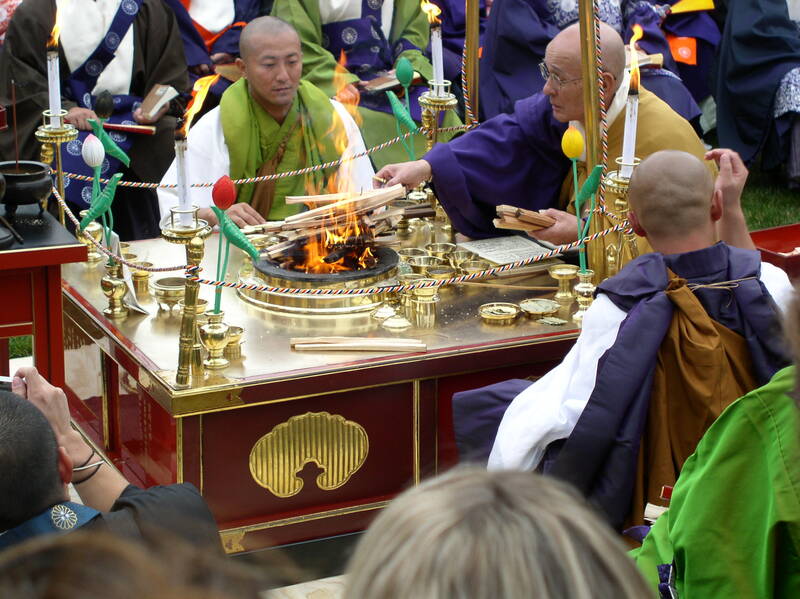 The following day, monks from Japan, North America and Europe traveled to the Boston Museum of Fine Arts to hold a fire ritual in honor of the 125th anniversary of the Tendai ordination of the founder and first curator of the museum. These two individuals were the first westerners to be initiated into the Tendai sect. In 2007 Rev. Fitterer established Celestial Drum Tendai Buddhist Sangha in Indian Lake, as an affiliate of Tendai Buddhist Institute, assisted by Daichi Jim Curry, also of Indian Lake. Fitterer began his Buddhist studies nearly 40 years ago and received Doshu Tokudo (temple assistant ordination) in 1998 and Soryo (lineage) ordination in 2003 from Rev. Monshin Paul Naamon, abbot of Tendai Buddhist Institute. From 1998 to 2005 he led Higashi Tendai Buddhist Sangha in Great Barrington, MA. He lives and works as a bookbinder in Indian Lake with his wife, Taff, and two cats. Even if we count the many lifetimes we have waited. We began chanting this verse when Karuna Tendai Dharma Center was a single, solitary dharma center. Now after 15 years it is chanted in all those places where other sanghas have been established by those who have studied and trained here. We chant it in Canada and Colorado, Albany and the Adirondacks, Washington, D.C., Denmark and Germany, and elsewhere. How many lifetimes we have waited is beyond my ability to see or to count—my vision does not go back so far. I leave that for another to relate, another more insightful than me. My vision does, however, go back 15 years to a warm spring evening in 1995 coming here for the first time where a handful people gathered—and a small handful at that—together with Monshin and Shumon. They had recently returned from Japan with the explicit aim of starting this Dharma center, based upon their experience living in a Tendai temple in Chiba. It was to be a place where people could, in their own community, with their friends, family and neighbors practice and study the Dharma every week under the guidance of an authentic teacher. This was the explicit goal. Another dream rested in the back of Monshin’s mind, too, one that he didn’t share with others—perhaps it was too audacious. And it was this: that if this actually worked, if people actually came to practice the Dharma every week, then perhaps he could train others as he had been trained by his teacher Ichishima sensei and they could go out and start additional sanghas and so foster the spread of the Tendai Dharma farther and wider than could be done by any single person working alone. Today’s ceremonies are a celebration of the fruition of those dreams. After meditation was complete that first evening we all drove down to LaBella’s in Chatham and shared pizza and beer and friendly conversation getting to know one another in an informal way. We did this for the next few weeks, but it became obvious that this would be unwieldy as more people joined us. And it has been reported that some people don’t like pizza. So the suggestion was made, ‘let’s have a pot luck dinner every week after the service’. And we’ve continued to do this down to the present time. First 72 labors brought us this food. As we receive this feast of the Dharma today, we should know how it comes to us. Seventy-two doesn’t begin to encompass all the labors. Monshin and Shumon themselves have performed infinite, myriad, uncountable kotis of nayutas of labors to establish and maintain this center. Add to that the contributions made by Sangha members, friends, families and neighbors; their financial gifts, the offerings of their physical labor, their ideas and advice, and their enthusiasm. Add to that the Jigyodan and other representatives of Tendai shu in Japan who have come in ones and twos, in groups of five or six, or thirty and forty, bringing material support, teaching support, and inspiration. We should know how it comes to us. We should consider whether our virtue and practice deserve it. And salute the all-wise Buddha. We, like ignorant and foolish people, Were ready to be content. Originally we chanted this verse, as the rest of the service, in Japanese. One year, as we were working on the English translation, Shunshou Yamada sensei was here teaching during gyo and I asked him about the last line, which puzzled me. The first three lines were straightforward, simply listing the notable names, but the last line, fuku ju kongo¸ was a mystery. Kongo, I knew, was vajra—diamond or adamantine representing a brilliant wisdom that was able to slice through any hindrance, or perhaps a sudden flash of insight that illuminates the sky for just a moment and shakes the earth with the sound of thunder. But what does fuku ju mean? And so he told me ‘long life, good fortune’. That’s it: ‘long life, good fortune, vajra, or diamond’, no subject, no verb, no object; an enigmatic phrase suggesting many possible meanings, but settling on none of them. For the purpose of the service we decided upon the wording we use now, “May the diamond path bring good fortune and long life to all sentient beings.” Perhaps, though, in this line Hogo is referring not only to the benefit that the lineage brings to others, but expressing its aspirations for the lineage itself: may the lineage continue to have a long life, may the lineage continue to have good fortune, may the lineage continue to shine with diamond-bright clarity dispelling any darkness. Receiving this offering, deserved or not deserved, we six named to this lineage vow that through our teaching and practice the aspiration voiced by Hogo will be fulfilled: may this lineage continue to have a long life and may the lineage continue to have good fortune, may the lineage continue to shine with diamond-bright clarity to all. In the distant future when our names are forgotten, may the efforts we made continue to enable others to attain the path, as your efforts and the efforts of all those who came before have enabled us. With deepest gratitude and respect, with a sincere heart, we thank you for all that you have done. Here in the North Country a few branches of leaves begin to show autumn colors by the end of August. In the past week I see some yellowing and falling to the lawn, foreshadowing the turn of the season from summer to snow. The setting sun is retracing the path it took in spring and the afternoon light falls now in early September as it did in mid-April. Last month at the Monday evening discussions at Celestial Drum we reflected how observation of the natural world serves as a mirror, giving us clearer understanding of our own lives. In September, during our Monday discussions, we extend these thoughts to “Life, Death and Rebirth”. Seeing the change of the seasons, seeing the fall of the leaves in September; the winter period of hibernation; the fresh new green of spring; the fruiting of summer are all representative of cycles of beginning, ending, and new beginning that take place moment by moment and eon by eon. The scale of time may be vast or nearly instantaneous, but the same process is occurring through all. We experience life, death and rebirth not only between lifetimes, but within this single lifetime as well; hourly, weekly, yearly; reflecting back that process of interlinking cycles we see in the natural world around us. Through reflection and Buddhist practice we gain a clearer understanding of the ever-flowing nature of life and death, our place within that flow, and the opportunity it offers to be free of transient sorrows. Our continuing discussion of the role of the natural world in Buddhism moves to a consideration of its importance in Tendai tradition and practices. Since the foundation of Tendai, the benefit of practicing in the bosom of nature has been recognized. 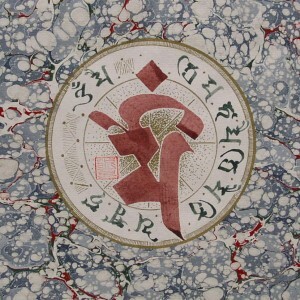 Over time practices which focus on the veneration of the natural world have evolved, perhaps best exemplified in the unique Tendai practice of the Kaihogyo. Buddhist writings and practices are filled with images of the natural world–the sun, the moon, the rain, remote mountains and deep forests–offering numberless suggestions for contemplation on change, compassion, insight and our place within nature rather than outside or over it. For the month of August during our Monday evening meetings we’ll discuss and practice some of these many ways.